BBC News will see a “big launch” in its move to responsive web design next week when readers accessing the site on a mobile will be redirected to the responsive version of the site rather than the desktop version. Chris Russell, head of product for BBC News online, talked through the shift to responsive design at today’s AOP Digital Publishing Summit. Responsive sites automatically scale to fit the screen size they are viewed on and have been adopted by news outlets including Channel 4 News and ITN, plus smaller outlets including student-run site Redbrick. The BBC News site has been in development for some time with “location and weather modules” recently introduced and video added within the past two weeks, Russell explained. He illustrated the importance of making the news site a good user experience on a smartphone by explaining that around 10 to 20 per cent of BBC News traffic currently comes from mobile. He added that BBC News “still wants to be in app stores” so does not see responsive design in replacing native apps entirely. Asked whether headlines and other content needs to be written with mobile in mind, he explained that BBC News has been doing that for many years, altering headline lengths for Ceefax pages, for example. This entry was posted in Events, Mobile and tagged aopsummit, BBC News, responsive web design on October 12, 2012 by Sarah Marshall. 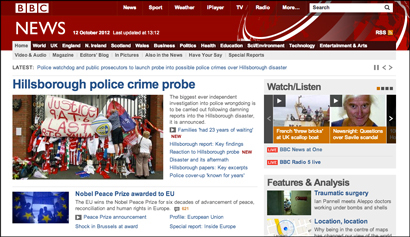 Is the BBC site truly responsive? It looks like it utilises user agents. Try resizing your desktop window, it doesn’t resize to fit the window, this is not responsive. Serving up different versions to different devices is fine, but it is not future proofed and it is not responsive.